Ethics throughout your supply chain are essential for your business and reputation. More than 4 in 5 customers claim that the ethical standards of retailers matter to them. As a business professional, you should have a strong commitment to continue to adopt the best practices for ethics throughout your supply chain. In this article we give you 10 tips to ensure that your business is following all ethical standards. What Are Supply Chain Ethics? Ethics are defined as someone’s moral judgments that govern their behaviour and actions about right and wrong. Ethics within your organization can be set by the business itself or by individuals. All decisions regarding ethics that are made within your organization affect the company and its culture. Being ethical and socially responsible brings significant benefits to your business. Ethics throughout the supply chain focus how businesses get from point A to point B. If you are following all of the standards and morals, then your supply chain has ethics. However, some businesses cut corners to find cheaper goods and labour, in an attempt to save money. Although this may save your business some income upfront, in the long run it will only hurt your reputation. Ethics affects your relationship with employees, other businesses, suppliers, investors, and your customers. Having strong ethics strictly relates to and portrays what type of business you are. If your business is not operating ethically, investors are less likely to buy stock, employees are more likely to quit, suppliers will stop supplying, and most importantly, profits will decrease significantly because consumers will no longer buy from your business. Most ethical business practices are now governed by law; however there are still some businesses who skimp out on the moral business standards. 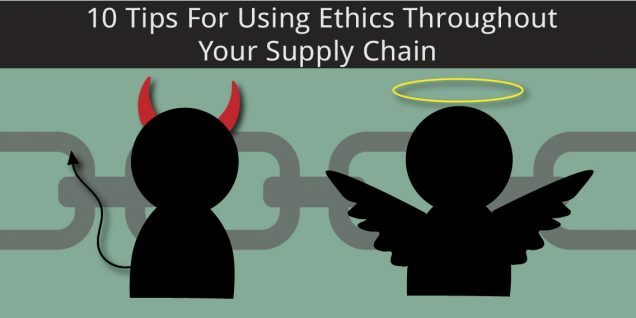 What Can You Do To Ensure Ethics Throughout Your Supply Chain? As an organization, you need to be aware of the ethics laws and how you are using it within your company. Many businesses produce their own ethical supply chain codes, which all suppliers must comply with. To ensure that you are keeping up with your ethical standards, you need to make sure that you are transparent. Transparency is important when dealing with employees and suppliers. You should take a look at where improvements can be made throughout your business and how you can use your ethical practices. The biggest way you can ensure that you are following ethical standards is by knowing your suppliers. If you are dealing with suppliers overseas it is harder to monitor the ethics they are following, but doing your research will help you to better understand your supplier and if they are complying with all ethical standards. Suppliers have a vast role in supply chains, meaning that their ethical practices also play a huge role. It is crucial to make sure that all moving parts of your supply chain are following the correct ethics. Here are some tips for ensuring proper ethical standards. Establish proper procedures for your company. Make sure your procedures align with the laws. Maintain a high standard of honesty and integrity in all relationships. Considering your environmental and social responsibilities. Measure more than just price or cost. Serve the public by having their interests and well-being in mind. Why Do Your Consumers Care? In society now, people want to know where the products they are buying are coming from. They’re now paying attention to what items are socially, ethically, and environmentally conscious. After some scandals surrounding how high profile products have been made, consumers want to ensure that they are supporting sustainable supply chains. It may cost more to follow the sustainable initiatives, however, it will result in stronger ethical relationships with your suppliers and customers. Are customers going to pay more for ethically produced items? That seems to be the case! In a report published in 2016, 66% of consumers are willing to pay more for goods that have a positive social and environmental impact. In fact 45% of customers are influenced to buy from companies who show their ethical impact. Most businesses who cut these important corners don’t think that it will have a large impact on their operation. In reality, using non-ethical processes hurts your reputation, and eventually, your bottom line. You can’t just be ethical within your own business. Now, your whole supply chain must be. Look closely at your suppliers and partners. Ethical supply chains are everyone’s responsibility, from an organization’s employees to its suppliers, customers and trading partners. See how having good ethics and a strong inventory management system can help! Schedule a Demo with Clear Spider today! Prev:Does Your Warehouse Check All The Boxes In This Freezing Weather?